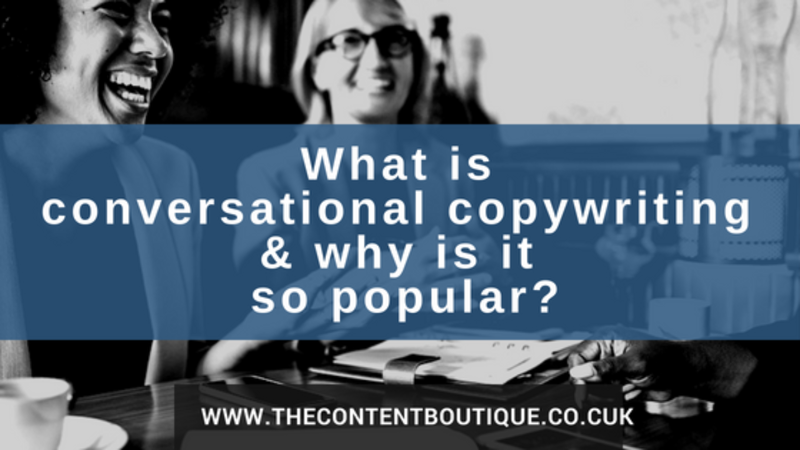 What is conversational copywriting and why is it so popular? Have you noticed how marketing is getting conversational? Think about it for a moment. Whether you are banking, buying insurance, or simply doing your weekly shop, the companies offering services to you present their messages in an open, friendly tone of voice. And when I finally got round to doing the Internet shop, Ocado reassured me it ‘Always reserves my favourite slot’. But back in the day, advertisers were limited by two-way channels such as print and television. Of course, the Internet changed all that. Today marketers have the platforms they need to start a dialogue with their audiences. OK, I know what you’re thinking. Isn’t conversational copywriting dumbing down communications? Isn’t it a bit patronising? My answer… No. People buy from people. When you write in a conversational style, you are transparent. You write words people want to read and can understand. Here’s another way to look at it. What are you trying to do with any marketing communication? You are trying to build relationships. On what do you base relationships? Openness and trust. You want to put people at their ease. How do you build relationships? You start a conversation. Because more often than not, people are happy to take part in discussions. So how can you adopt a more conversational tone? Don’t try to write for the many. Keep your reader front of mind when you write. Don’t try to impress your reader with difficult words or jargon. You wouldn’t use them in everyday speech. What do we do when we want to strike up a conversation? We ask questions. Because questions get people thinking. Here’s another tip. To get inside your readers’ minds and empathise with them, ask rhetorical questions. Then answer them. Glide your reader through your copy with words and phrases that link one sentence to another. Some common transition words include: First off, however, let me explain, and here’s the thing. I’m going to shock you here. I’m going to permit you to start your sentences with the words ‘And’ and ‘But’. I’ve said this before; stories spike curiosity. Better still they’re memorable. So include anecdotes in your writing. Also, draw people in by relating what you do to everyday situations. People don’t like being sold to. But if you use a conversational tone of voice, then you’ll encourage your reader to join in a discussion. To get your tone of voice right, picture your reader sitting in front of you. Don’t use difficult words, talk to your reader in plain English. Get the conversation going by asking questions. Forget what your English teacher taught you, start sentences with words such as ‘And’ and ‘But’. Help your reader glide through your copy by using transition words and phrases. Draw your reader in by telling a story. If you would like help writing conversational copy, then drop me a line to get information about pricing.